Incisive fossa is a small hole located anteriorly in the midline behind the incisor teeth, into which the incisive canals open. Each incisive canal/foramen, right and left perforates the equivalent side as well as ascends into the conforming nasal cavity. 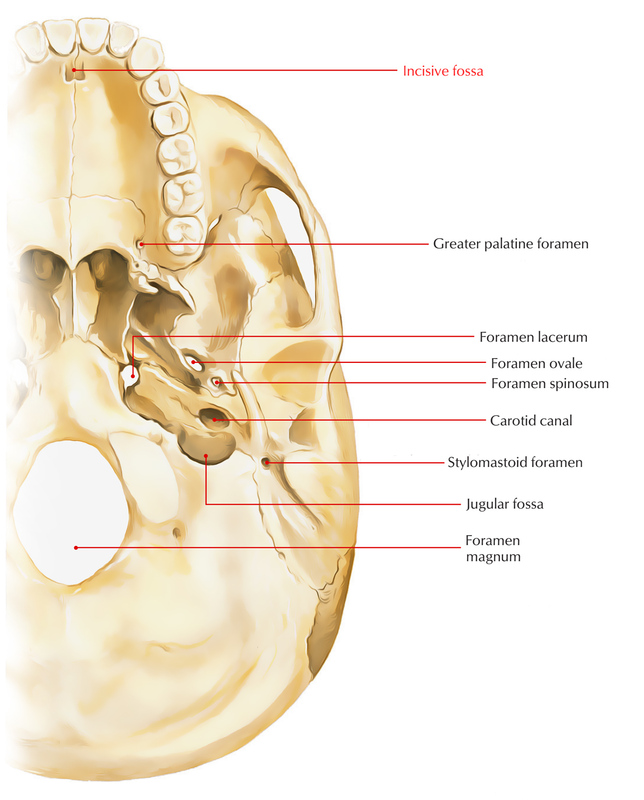 The incisive foramen conveys ending portions of the nasopalatine nerve along with greater palatine vessels. Sometimes two more foramina are present, anterior and posterior. Then the left side structures travel via the anterior foramen along with the right side structures from the posterior. Left nasopalatine nerve travels via the anterior wall of the incisive fossa. Right nasopalatine nerve travels via the posterior wall of the incisive fossa. The terminal part of greater palatine artery passes through the incisive fossa.